Why Does the World Hate Christians, Part 1? As I was writing my series on the Great Commission, I had another thought and started focusing in on something somewhat related to that subject. As one does, I happened to come across a pictorial meme on a social network which essentially stated outright that Oklahoma bomber Timothy McVeigh was a Christian AND a terrorist so those on the “right” need to shut up about Muslim terrorists. 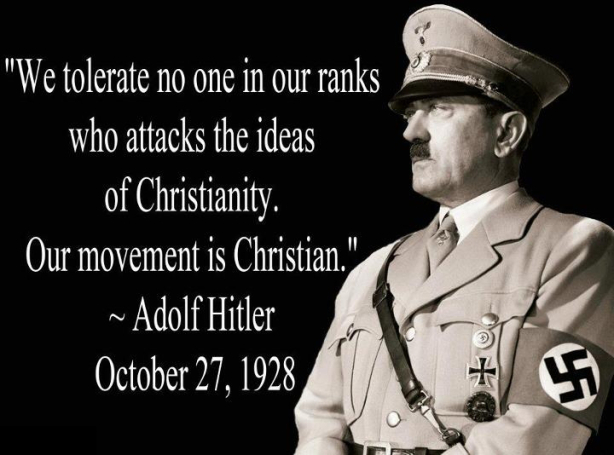 People also reference Hitler and his alleged Christianity as another “proof” that Christians are hate-mongering idiots. Interestingly enough, this world has become meme-driven. We read or hear one meme after another, which is little more than an attempt to take a very multi-faceted and even somewhat complex subject and distill it down to a sentence or two; the fewer the words the better. Of course, this usually misses the boat entirely but people can remember a few words or a sentence and even if it does not accurately reflect the truth of the entire subject, it becomes truth for way too many people. People who are opposed to Christians and Christianity are generally (but not always) people on the left. Many of these people attend some sort of church themselves but thoroughly eschew the type of strict and rigid biblical traditionalism found within folks on the right; usually conservatives. Those on the left normally denounce those “Christian right-wingers” for all sorts of reasons and they do whatever they can to distance themselves from that group. This is usually done by embracing the less traditional aspects of society. The more far-out those aspects are, the better. This is one of the reasons the federal government is now trying to force people to use essentially one bathroom. It’s really a move to eliminate differences in gender, therefore, it is hoped to ultimately create a classless, genderless society. We are on our way. But in spite of all this, it got me to ask this question: Why does the world hate Christians the way it hates us? First, Christians have become very issue-oriented. Ever since the beginnings of the modern-day Dominionist movement, followed by the Moral Majority, and continued by Christian Reconstructionism and the circus accompanying it out of the signs and wonders crowd, the emphasis within Christian circles seems to have moved beyond simply preaching the gospel to those who are lost and on their way to hell. The emphasis now is on changing society. Oh sure, this is done by increasing the number of Christian workers in society and by seeing lost people convert to Christianity. As they come into local churches, they take up their role (and armor) with a frontal attack on the kingdom of darkness. As this kingdom of darkness is pushed back (ostensibly), the Church gains victories. When we have enough victories under our belts, the Kingdom of God will be physically established here on earth and voila! Jesus can return. As I’ve stated previously in my series on Dominionism (and also on the other current series on the Great Commission), when Christians allow themselves to be deceived into thinking that our true calling is ultimately in changing society and not in preaching the gospel to the lost, making disciples of people from all nations and teaching them how to live the life of a Christian here on earth, we tend to become very issue-oriented. We start seeing homosexuals and transsexuals, etc., as issues and therefore problems because we do not see them as people any longer. They become enemies and as such, need to be dealt with as enemies. It’s interesting though because I do not see that in the gospels in Jesus’ interactions with the average person. Jesus treated people like people with one huge issue – they were lost and He came to set them free. Their freedom would come only through embracing the truth about Jesus. Once they began following Him and once there was a true “born from above” experience (cf. John 3:5-8), the actual work of being a Christian came into play. To remind us, this “work” that follows conversion to Christianity is not to gain or even to maintain salvation. The work is to grow in our relationship with Jesus, who is very much alive today, though not physically present in this world. But because Christians have allowed themselves to be duped by the Dominionist crowd, too many believe that it is not only our job to preach the gospel, make disciples of people from all nations, and teach them how to live the Christian life, but it is also too readily believed that we must change society to conform to a biblical standard. This is Jesus’ job and He will take care of it upon His physical return to this planet, but Dominionists tell us it is the job of the Christian to make this happen. Because of this, Christians often demonize people who are different. Instead of simply relegating all of society to two groups – saved and unsaved – Christians today make it appear as though being a homosexual or transgender is worse than living together out-of-wedlock. The truth is that this is what unsaved people do. Why? Because they are unsaved and do not have the Holy Spirit living within them. Being issue-oriented has pitted Christians against the world so is it any wonder the world hates us? When we see groups like Westboro Baptist Church with their signs filled with vulgar language stating God hates certain groups, this furthers the problem. It engenders hate and the world couldn’t care less about trying to distinguish between Westboro and other conservative or even authentic Christians. Interestingly enough, they can do this where Islam is concerned and we’ll talk about that later because it indirectly ties into the second and third reasons for why the world hates us. Issue-oriented Christians – no matter how altruistic things seem – can end up being a catalyst for hate and can cause the lost of this world to lose sight of the fact that they are lost and in need of a Savior. Above all things, we should seek to introduce lost people to Jesus for their eternal salvation. The world hates people who identify as Christians (whether authentic or professing), too often because we seem not to care about people, but are far more concerned about the issues that the Elite throw at us. We’ll discuss the second reason the world hates Christians in our next installment of this short series. Entry filed under: Agenda 21, christianity, Cultural Marxism, Emotional virtue, eternity, Global Elite, Political Correctness, Politically Correct, Politics, Religious - Christian - End Times, Religious - Christian - Prophecy, Religious - Christian - Theology, salvation, second coming. Tags: adolf hitler, great commission, timothy mcveigh. Let’s Take the Great Commission from the Top, Part 3	Why Does the World Hate Christians, Part 2?